On the 30th Anniversary of the BC Mine Reclamation Awards, the Technical and Research Committee on Reclamation celebrated 30 years of excellence in mine reclamation in the Province of British Columbia. The work presented over the last 3 decades at the Mine Reclamation Symposium has inspired many, and lead to the continued development and enhancement of reclamation practices throughout the Province and abroad. Our mines continue to demonstrate that mining can be a temporary use of the land and that the legacy of mining can, and should be, a clean, safe and productive environment. The efforts are appreciated, and further, some acknowledgements are due. 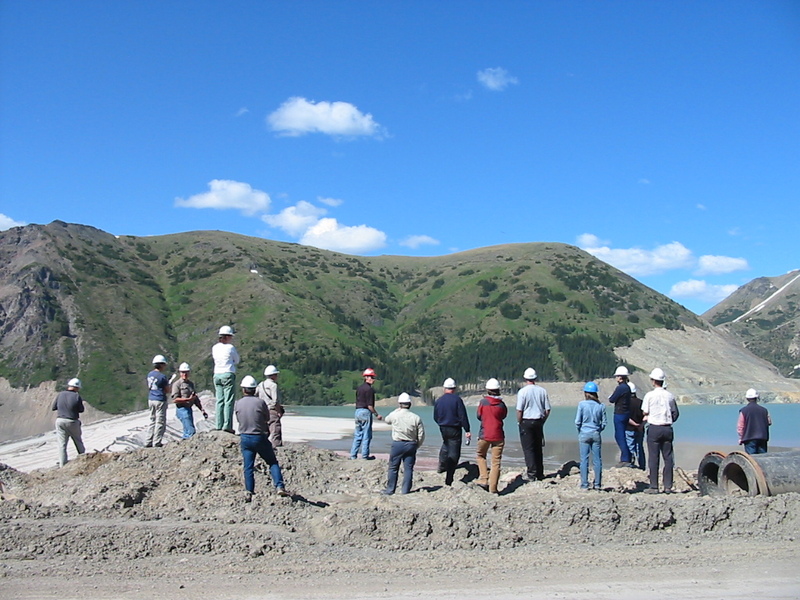 Thirty years ago, the British Columbia Technical and Research Committee on Reclamation established a Reclamation Award to recognize outstanding achievement in mine reclamation in British Columbia. In addition to this major award, citations are given to recognize merit in mining reclamation. work of a high standard that has been conducted over a number of years. 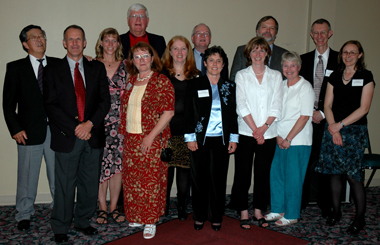 For 2005 work, the Committee received 9 excellent nominations in 3 categories. It is an annual tradition to present a “keeper trophy” to last year’s recipient of the British Columbia Mine Reclamation Award, for the safe return of the highly prized “jade trophy”. Last year’s winner of the Award was North American Metals Corp. for its very fine reclamation work at the Golden Bear Mine. 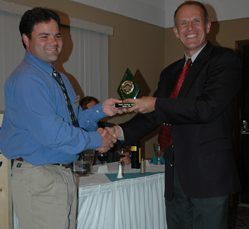 Mike Aziz accepted the “keeper trophy” on behalf of North American Metals Corp. The Citation for outstanding achievement for reclamation at a mineral exploration site was awarded to NovaGold Canada Inc. for their work on the Galore Creek property. An extensive exploration program has been on-going for the past several years Galore Creek in lead-up to the proposed development of the Galore Creek mine. In 2005, more than 200 drill sites were developed and over 186 of those were reclaimed. From the outset, the drilling program was conducted in a manner to minimize site disturbance. Reclamation involved plugging holes with safety plugs and cement or bentonite, removing drill pads, and cleaning up all equipment and left over debris. All sumps were backfilled and brush was spread on forested sites. In addition, large timber was left whole instead of bucking it into shorter lengths so it can be milled at a small sawmill set up near the camp. Along with the new drilling program, significant clean-up from previous exploration programs was undertaken. NovaGold removed tonnes of trash and garbage of various sorts including numerous fuel drums, drill rods, hoses, aircraft parts, assay lab reagents, batteries, and more. The company also developed an excellent system of tracking and recording site disturbance and reclamation work using detailed tables and photo logs. Nova Gold Canada Inc. has performed exemplary reclamation of current drill sites and has shown responsible stewardship for cleaning up more difficult historic disturbance and contamination. Their work has been diligent and thorough and is well deserving of recognition. 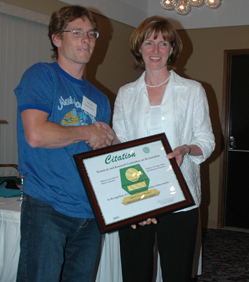 Kelly Franz accepted the reclamation Citation for Mineral Exploration on behalf on NovaGold Canada Inc. 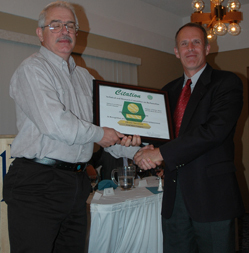 The Citation for outstanding achievement for reclamation at a Metal Mine was awarded to Highland Valley Copper for the Highland Valley Copper Mine. This award is in recognition of the excellent reclamation work that is ongoing in the Highmont tailings area. This challenging high elevation tailings area was to be reclaimed to provide forage. It was initially revegetated in the early 1990’s however the reclamation was not performing optimally and so, in the last several years, the area was given a boost with the application of GVRD biosolids. The application of biosolids has been very beneficial to boosting plant growth and assisting with soil development. HVC has invested in research into maximizing organic matter production and in developing innovative monitoring and remote sensing techniques. These programs indicate increasing trends of biomass production over time suggesting that vegetation in some areas is becoming self sustaining. Highland Valley Copper has participated with Agriculture Canada in grazing studies to investigate the potential for molybdenosis in cattle from foraging on vegetation with high concentrations of molybdenum. The research has concluded that the use of salt licks amended with copper sulphate greatly reduces the incidence and severity of molybdenosis and that cattle muscle and fat tissue are safe for human consumption. This work provides confidence that the reclaimed mine lands at Highland Valley Copper can be put to productive use. Highland Valley Copper is moving forward on addressing high molybdenum water quality issues from the Highmont tailings area through research. The establishment of Sulphate Reducing Bacteria (or SRB) ponds and the development of substantial wetlands on the surface of the tailings have had some positive effects for improving water quality. Work continues in the hopes that metal concentrations in seepage can be reduced to the point where safe discharge to the environment can occur. Efforts to enhance habitat diversity at Highmont are also paying off. Improvements have been made to wetland areas to protect seasonal mudflats for shorebirds and to provide waterfowl and ungulate cover. Overall, species diversity and colonization by wildlife are increasing in the Highmont tailings area as Mother Nature gains a foothold. The Highmont area is well on its way to achieving its reclamation goals by re-creating a productive eco-system. As well, Highland Valley Copper is also on its way to advancing its corporate goals of sustainability and productivity. Mark Freberg of Highland Valley Copper accepted the Reclamation Citation for Metal Mining for the Highland Valley Copper mine. The Citation for outstanding achievement for reclamation at a coal mine was awarded to Elk Valley Coal Corp. for its work at Elkview Operations. The Elkview operation has been actively mined since 1898. It has the longest active reclamation permit in the province (Mines Act permit C-2) and it has had a long and varied history of ownership which has meant a bumpy road for reclamation priorities over time. But the reclamation plan for Elkview has been founded on some of the most extensive reclamation research in the province. Elkview Operations has been a leader in the development of reclamation solutions for more than 30 years. Extensive research has been undertaken on this property over the decades. Some of the recent research has resulted in new and innovative methods of monitoring elk nutritional status during the winter months and the development of a modern conceptual reclamation plan with clear and measurable results based on objective standards for assessing reclamation success. Significant reclamation success has been achieved on the Bodie dump which began in 1996. The dump has been designed and constructed in a bottom up fashion to allow quick reclamation of lower areas while active mining continues in upper areas. The reclamation objective for this area is winter range habitat for ungulates. The accelerated reclamation approach ensured that productive capacity of winter range areas was maintained during the early development. Now, the productive capacity of the reclaimed portions of the Bodie dump exceeds the capacity of the entire area pre-mine development. Recent wildlife surveys boast the largest recorded populations of elk and mule deer on the Elkview property in over 20 years. The mine continues to enhance the complexity of vegetative cover through woody species planting to assist in diversifying wildlife habitat. In high alpine areas, although severe biophysical conditions exist, Elkview is achieving very good reclamation success through their revegetation with seeded species, followed by trees and shrubs and the increasing colonization by native species. The incorporation of large woody debris into the reclamation prescription has already enhanced the use of these areas by wildlife. The creation of juvenile sub-alpine forests will aid in achieving highly productive wildlife habitats in these high elevation areas over time. In addition to the reclamation of newer disturbance, Elkview operations has done an excellent job of reclaiming historical mining disturbances in the Michel Creek Valley including the former sites of a coal fired power plant, coal coking ovens and three small town sites. Significant riparian restoration work has also been undertaken along Michel Creek which suffered serious degradation due to historic mining practices. This work involved resloping, rip-rapping, and live staking and brush layering to stabilize the bank. Wildlife use is expected to increase over time in this area as trees mature. This riparian restoration work also compliments the reclamation conducted on the slopes above and overall provides a significant improvement to the ecological conditions of the area. Elk Valley Coal Corp. continues to demonstrate its long-term commitment to successful reclamation at the Elkview mine. Dave Ryder accepted the Citation for outstanding Coal Mine Reclamation at Elkview Operations on behalf of Elk Valley Coal Corp. 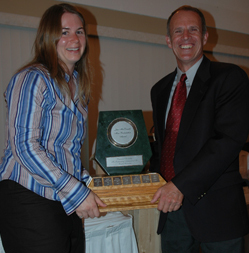 The recipient of the 2005 British Columbia Jake McDonald Mine Reclamation award is Elk Valley Coal Corporation for their outstanding reclamation achievements at Fording River Operations. Fording River operations is Canada’s largest producer of metallurgical coal and they have consistently made reclamation a priority by setting high standards for achieving reclamation goals and the re-creation of pre-disturbance values. Since its first implementation of reclamation research in 1969, Fording River Operations has been a leader in mine reclamation in the Province of British Columbia. (By the way their Mines Act permit number is C-3). Approximately 600 of 4000 hectares of disturbance have been reclaimed to date. Fording River Operations’ consistent commitment to reclamation and their substantial contributions to the state of reclamation knowledge and techniques in the province of BC, make them eminently deserving of this award. Fording River Operations has conducted a very well founded reclamation program that dates back several decades. Research into the establishment of productive forests on the waste rock dumps has been ongoing since the early days of mining. Today stands of established forest serve as excellent cover for elk and will also provide an effective forest cover into the future. Fording River Operations has placed an important priority on the re-establishment of fish and wildlife habitat. From the creation of a ground water channel in an old gravel extraction area to the development of shrub species on the steep slopes of the proposed winter ranges, the wildlife reclamation work at the mine shows an important understanding of key ecological elements and a dedication to detail. The Fording River mine currently supports a diversity of wildlife including elk, bears, sheep and a host of other species. The greenhouse and woody species production facilities provide planting stock for the Fording River Operations as well as the other Elk Valley Coal operations. A diversity of woody species are being produced at the mine that will lead to the re-establishment of productive ecosystems in the years ahead. Stands of grasses and legumes currently provide nutritious forage for the large number of ungulates on the property. Resloping of waste rock dumps continues to be the major challenge at the Fording River Operations. Although legacies from earlier mining continue to present a challenge, innovative waste placement methods help to reduce the costs associated with this activity. The outstanding reclamation efforts of Fording River Operations has been recognized many times in the last decade; notably the Citation for coal mine reclamation was awarded to Fording in 1995, 1997, 2000, 2004 and 2005. 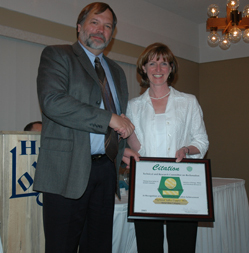 Carla Fraser from Elk Valley Coal Corporation accepted the 2005 British Columbia Jake McDonald Mine Reclamation Award on behalf of the Fording River mine. The B.C. Technical and Research Committee on Reclamation is comprised of representatives from the mining industry, the academic field and Provincial and Federal Governments. 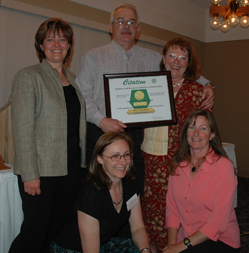 From left to right: Bob Hamaguchi, Highland Valley Copper, Bill Price, Natural Resources Canada and 2006 Symposium Chairman, Wendy Gardner, Thompson Rivers University, Art O’Bryan, retired Ministry of Energy, Mines and Petroleum Resources and Symposium Venue Coordinator, Brenda Dixon, Natural Resources Canada, Cathy Pomeroy, Western Canadian Coal Corporation, Peter Jarman, Ministry of Environment, Barb Riordan, Thompson Creek Mining Limited, Incoming Symposium Chairman, Mark Freberg, Highland Valley Copper, Kim Bellefontaine, Ministry of Energy, Mines and Petroleum Resources,Carol Howell, Ministry of Energy, Mines and Petroleum Resources, Bob Hart, Environmental Assessment Office and Kim Bittman, Teck Cominco Limited.